The Alberta Native Friendship Centres Association is the Provincial/Territorial Association of 21 member Friendship Centres. A healthy, thriving, culturally connected urban Indigenous community. The Alberta Native Friendship Centres Association supports active member Friendship Centres who, through program and service delivery, engage with and improve the quality of life for urban Indigenous people. The ANFCA is committed to supporting the principles and grassroots approach of the Friendship Centre Movement. The ANFCA priorities are guided by its member Friendship Centres and subsequent defined community needs. Indigenous cultural teachings, values and identity are at the core of the ANFCA. We provide opportunities for cultural sharing, focused on bridging the gap between the Indigenous and non-Indigenous worldviews. All programs and services incorporate cultural values and teachings into their structures. The ANFCA is committed to creating effective, vibrant national and provincial partnerships, focused on collaboration and common goals. The ANFCA respects the autonomy of its member Friendship Centres. 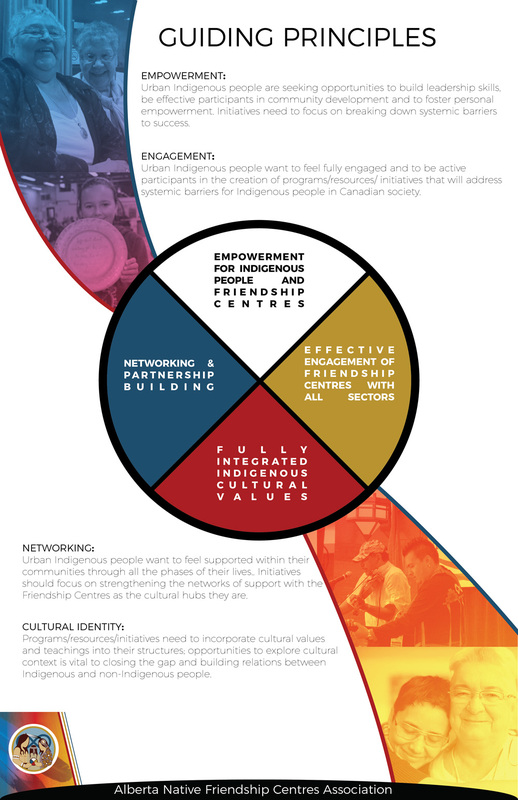 The ANFCA supports its member Friendship Centres in creating safe, friendly, welcoming, status-blind urban hubs that provide culturally appropriate programs and services and create opportunities for Indigenous people and communities to become empowered, to enhance their leadership skills and to be fully engaged and involved in community development.